This project takes some time to finish, so you want to figure about three hours to complete it. There are patterns for the stable and the figures. Supplies needed include two 22″x 28″ brown poster boards for the stable, white card stock for the figures, and crayons, colored pencils, or thin colored markers. This would be a nice family project that could become a family heirloom. 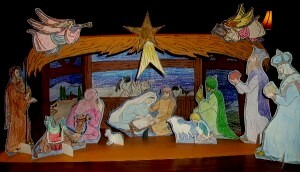 This project, “Nativity Stable Scene,” is found in the Christmas Projects Gallery in the sidebar. This entry was posted in Christmas Projects and tagged baby jesus, Christmas, christmas craft, christmas projects, christmas projects for kids, heirloom, holy family stable scene project, joseph, mary, nativity craft, nativity scene crafts for kids, nativity scene to make, nativity stable scene, poster board nativity stable, stable. Bookmark the permalink.